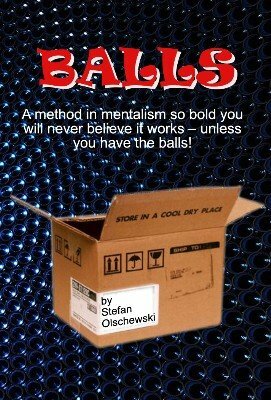 A method in mentalism so bold you will never believe it works – unless you have the balls! A sealed cardboard box is seen standing in full view or hanging from a stand – it can also be given to an audience member at the beginning of the show. Random people call out random things: dates, the amount of money in their pocket, holiday destinations – whatever you (or they) like. The box is retrieved and opened by a spectator. Inside is a wooden cigar box which contains a single black envelope. The spectator opens it herself and reads out the prediction – of course all the details match! The manuscript is only seven pages long, no flashy fuss, no glamorous pictures … It has been said that if you want to make sure that something will be forgotten, write a book about it. Stefan thinks the bold little secret you are about to learn is so damn good that it should be forgotten immediately and only used by those who really appreciate the method. So: are you one of those who realize what they are now holding in their hands or will you rather forget it as soon as you have read it? 1st edition 2011; 7 pages. Through the clever use of combined older methods, Mr. Olschewski has created a terrific 2 person concept that can also be accomplished as a single performer. The props are as promised, very inexpensive and should not require much maintenance or wear thru regular use. Whenever I see his name attached to an effect I know it will be something of quality. Once again, Mr. Olschewski does not disappoint. For such a meager investment you will gain a utility that has abundant possibilities.